The TAPR TNS-BUF is a very low noise, high isolation, buffer amplifier for use in time and frequency measurement applications. It's designed for use at 5 or 10 MHz, but is usable with some loss of gain from 1 MHz to at least 50 MHz. 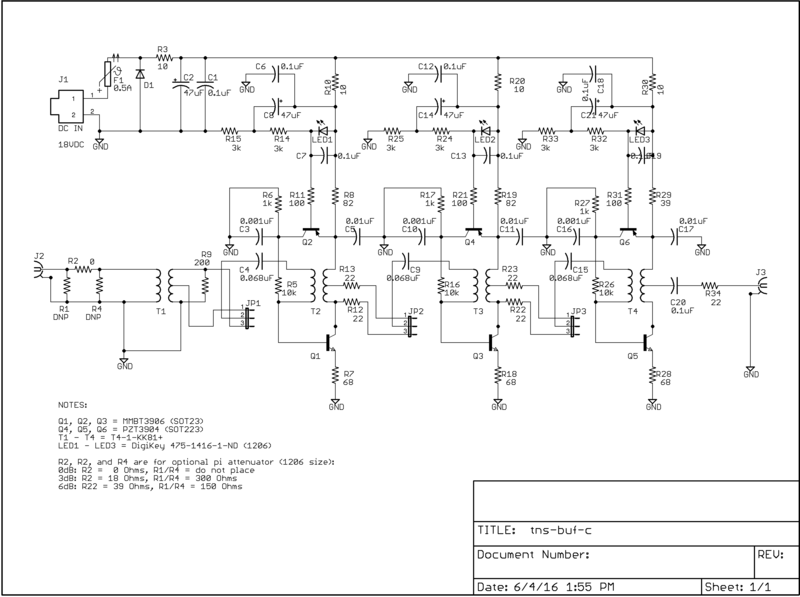 The TNS-BUF circuit was designed by Bruce Griffiths and John Miles provided valuable input on both schematic and layout. This page documents performance of the Rev. B prototype; production units will be based on the Rev. C board, which is electrically identical. 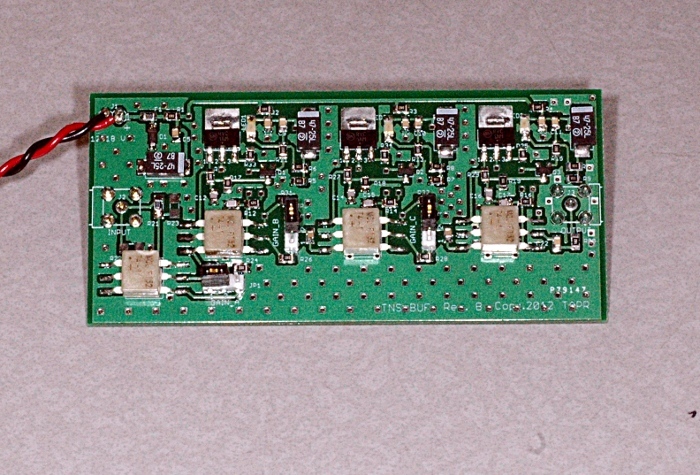 The TNS-BUF is built on a 1.75 x 3.75 inch board using 0805 size surface mount components. In the picture above, the SMA connectors are mounted on the reverse side of the board. In this plot, the TNS-BUF jumpers were set to 2-3, 2-3, 1-2 to yield about 1 dB gain (see below for a complete table of gain versus jumper settings). It's very important to use this rather than the alternative 1-2, 2-3, 2-3 setting; that setting causes a phase noise increase of more than 10dB. The TNS-BUF has three jumpers that set the gain of the unit from about -10 dB to +7 dB. 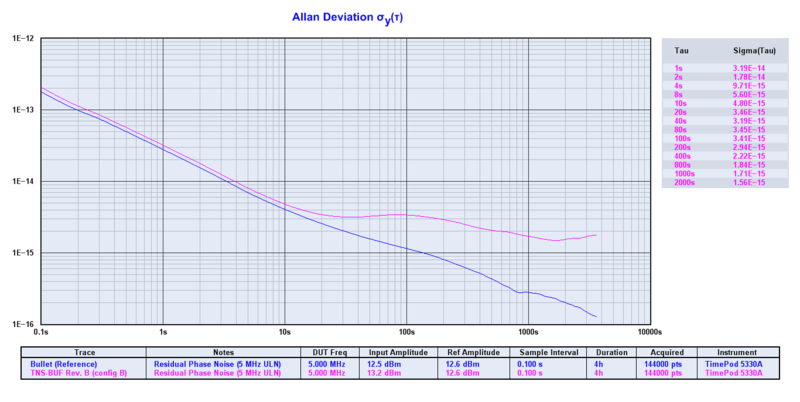 The gain settings have some impact on the return loss, especially above 15 MHz. The following plots show the gain and return loss with all jumpers set for maximum (yellow and cyan) and minimum (green and red) gain. As noted above, the 1-2/2-3/2-3 setting has much worse phase noise, because the gain is coming from the second and third, rather than the first and second, stages. Putting the gain in the early stages maximizes phase noise performance. GAIN_A has the most impact on frequency response and return loss. From the table above, it looks like gain settings 2-3/2-3/1-2 and 1-2/2-3/2-3 yield about the same gain at 5 and 10 MHz. 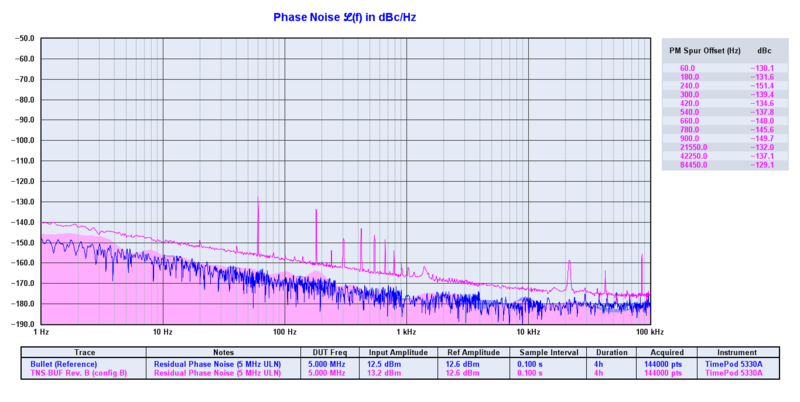 But at 80 MHz the first setting gives -1.2 dB gain and a return loss of 4.2dB, while the second -2.7 dB but has a much better return loss of 13.9 dB. 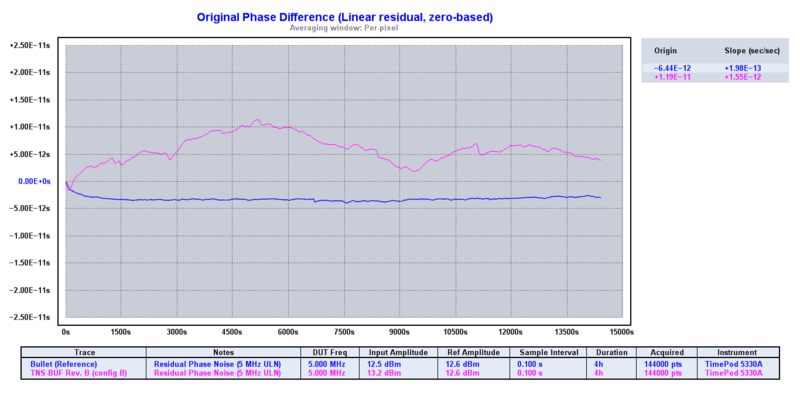 At 10 MHz, the return loss is marginally better with GAIN_A set to the low position. Relative gain and return loss at 1 MHz are not noticeably affected by the GAIN_A setting; gain is down about 4 dB from that at 5 MHz and the return loss is about 20 dB. The limiting factor at the low end of the range is the performance of the four Minicircuits transformers, which are spec'd for 1 MHz and above. A key requirement for many applications is high reverse isolation -- that is, how much a signal going backwards through the buffer is attenuated. High attenuation is required to avoid injection locking and other problems in low noise measurements. The theoretical reverse isolation of the TNS-BUF is well over 100dB, which is a tough thing to measure. With all the stops pulled out, my old 8753C VNA can measure down to about -110dB. The TNS-BUF was at the floor of that measurement. An alternative measurement using a signal generator and spectrum analyzer shows an isolation at the minimum gain setting of 111.8 dB, and at the maximum gain setting of 103.7 dB. Given the high dynamic range required for this measurement, I don't want to put a specific number out there until I can do further testing, but it's safe to say that the TNS-BUF has at least 100-110 dB of isolation.